How the Size of the ArrayList Increases Dynamically? In this post, I am going to demonstrate how the size of the ArrayList increases dynamically? The ArrayList size increases dynamically because whenever the ArrayList class requires to resize then it will create a new array of bigger size and copies all the elements from the old array to the new array. And now it is using the new array’s reference for its internal usage. As the old array is no longer in use, it will be garbage collected in the next garbage collection. Let's see how ArrayList size increases dynamically in detail. As we know that Array is fixed length data structure and once it is created, we can't change its size but ArrayList can re-size itself when gets full depending upon capacity and load factor. Basically, the ArrayList is a resizable-array implementation of the List interface. Implements all optional list operations, and permits all elements, including null. 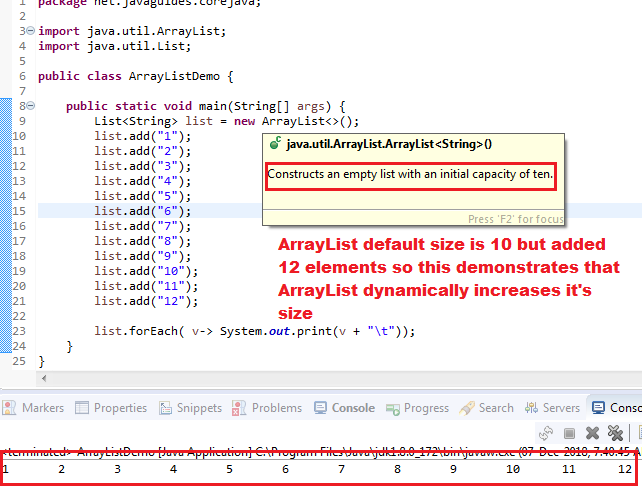 Let's create an example of ArrayList with default Constructor to know the default size of 10. From the above example, the default constructor is used to create an ArrayList instance. new ArrayList<>(); - Constructs an empty list with an initial capacity of ten. Let’s take a look at, what is present inside the ArrayList class. We will be looking at implementations according to Java 8. ArrayList increase the size dynamically while adding the elements to it, so look at the internal working of add() method. Look at source code of ArrayList and how it grows its size? This source code is copied from ArrayList implementation class to demonstrate how ArrayList grows dynamically(JDK 8 version). Observe the DEFAULT_CAPACITY instance variable in aisigned with value 10. As more and more elements are added to the ArrayList, the size of the array keeps on increasing. How does that happen ? * Appends the specified element to the end of this list. Also look at how ArrayList inserts the specified element at the specified position in this list. Shifts the element currently at that position (if any) and any subsequent elements to the right (adds one to their indices). * any subsequent elements to the right (adds one to their indices). Whenever the add method is called, it makes a internal call to the private ensureCapacityInternal method and passes existing size+1 as a method argument. The ensureCapacityInternal() method internally makes a call to private ensureExplicitCapacity(int minCapacity) method. The ensureExplicitCapacity() checks the condition theminCapacity - elementData.length > 0 , if it is true then it calls the grow() method to increase the size. The grow method creates a new Array of size int newCapacity = oldCapacity + (oldCapacity >> 1) and then copy all the elements in the new array from the older one. * number of elements specified by the minimum capacity argument. So the backing array is not growing, every time when it is full, The ArrayList class is creating a new array of bigger size and copies all the elements from the old array to the new array. And now it is using the new array’s reference for its internal usage. As the old array is no longer in use, it will be garbage collected in the next garbage collection. Do comment, if you have any doubts in this demonstration.